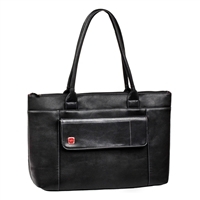 Stylish lady's bag for laptops up to 15.6". Made of high-quality PU leather to protect your laptop from possible damage. Laptop compartment has thickened sides and a strap for a better hold. Two inner pockets for documents, accessories and Tablet up to 10.1". Capacious main compartment easily accommodates all necessary accessories. Front pocket with magnetic clasp for mobile phone, business cards, accessories. Contrasting red lining interior. Comfortable extended handles. 16.54" x 11.22" x 2.2"
17.725" x 11.81" x 4.33"